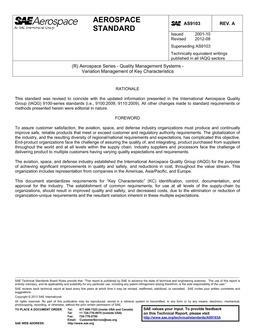 This document provides a basic uniform method for ensuring that aerospace standard parts (products) conform with the requirements of technical specifications referring to qualified parts and for a manufacturer of such parts to have a qualified management system at least equivalent to AS/EN/SJAC9100. These standards apply when called out in the aerospace standard part standard. 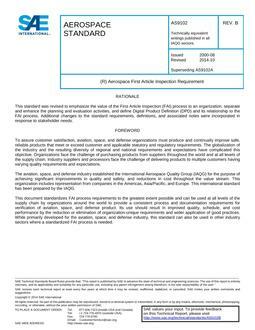 NOTE: This standard is published as an equivalent document in several countries. This standard uses the 9100 designation when referring to this standard. NOTE: This standard is published as an equivalent document in several countries. This standard uses the 9103 designation when referring to this standard.